Following up on Amazing Ankara, Beautiful Bursa and Superb Salonica, today we have Kolorful Konya, from an 1891 American map of Turkey in Asia published by D. Appleton and Co (New York). 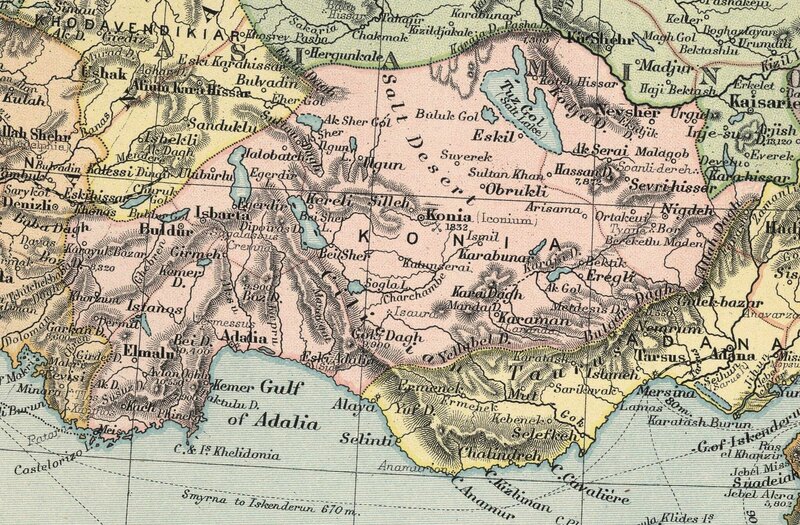 It's a beautiful map, but we're really just posting it as an excuse to reprint a poem about Konya from Bryan McCann. This year Professor McCann is leading Georgetown's semester abroad at the McGhee Center for Eastern Mediterranean Studies in Alanya. In addition to this poem, his blog features a unique comparative perspective on Turkey and Brazil, covering topics like human rights, street scams and Saint George. Konya, O unlovely Konya, let us not speak ill of you. Dervish skirt of blank expanses and mystic core, I have seen your alleys crowded with gaunt men drinking tea. I have seen your covered women in the marketplace, heads down, not lingering. On your fringes I have seen two boys riding two bicycles, not one on each but two on one, towing the other by the hand. Why? Such knowledge, like much else, is forbidden me. I have seen your black-vested man driving the weather-beaten Audi 504c, left hand out the window to hold down the mattress on the roof, son standing at his right shoulder between the two front seats, older woman, covered in black shawl, in the back seat. Hittite roadstead, Seljuk redoubt, I have seen the geometric perfection of your turquoise-tiled madrassah. City of Rumi, where is the love? In your young men walking arm in arm. In your dervishes offering apple tea. Not in your vast and teeming traffic circles. City of cautious travelers, learning to whirl. Not so fast, yabanci. City of dusty walls, I have stayed in your Rumi Hotel. If the hotel is Rumi enough, there is always vacancy.